Data for the Toshiba SCiB™ SIP series rechargeable battery are available for download from this page. If you are a new user or forgot your password, click here to register. System component documents You can download the startup guide, instruction manuals and specifications. 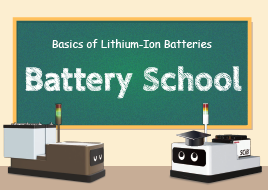 Basics of Lithium-Ion Batteries — Battery School —We explain the basics of batteries in simple terms.